This post is mostly part two of getting up to speed with what I have been doing musically to get ready for my second trip to Berlin. 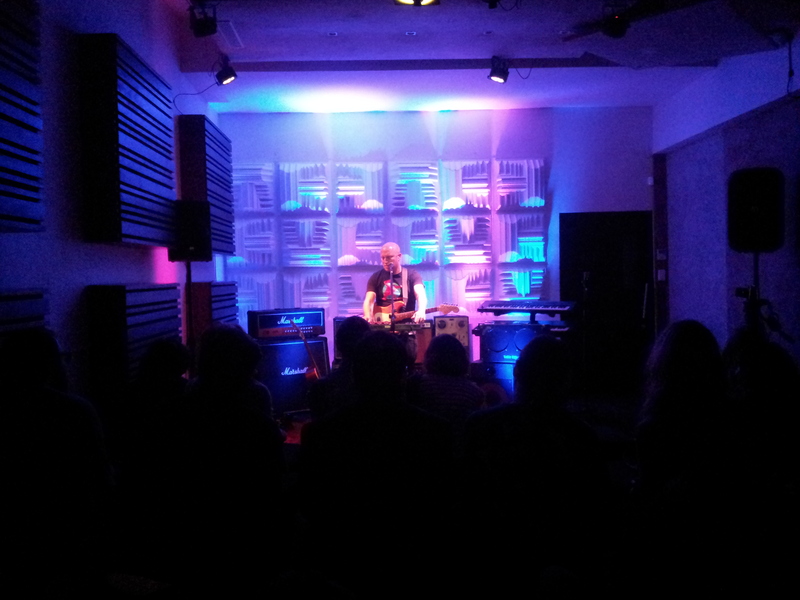 But quickly before that, I played a really great show at Openroom Productions last night. It was the first public show of my new setup (following my actual first show at a friend’s birthday party last week – and I will go into the setup in my next post) and while I was very nervous and tense and living in perpetual fear I think it all went very well. Darryl Torr had invited me to come play and his team had set up the place amazingly. They also filmed the show which I will hopefully be able to post here sometime soon. A bunch of my friends came through to watch, which was really awesome, and I got some great compliments and feedback. Phew!!! I imagine it will take twenty or thirty shows to fully relax into it but that’s what the next six months are be about. Live at Openroom Productions – my inner turmoil hopefully not shining through. Thanks Colin for the pic! But so, onto part two of Stop Me If You’ve Heard This One Before, in which I gain a couple insights and develop a couple opinions concerning the similarities and differences between being a little known singer-songwriter in South Africa and a completely unknown one in Berlin. 1) As a musician coming out the slightly left-of-centre rock or folk world, the differences between trying to create a career for yourself in a country like South Africa (where mainstream rock music itself is a pretty niche concern) and a country like Germany (which is a cultural and economic centre of The West) is massive. You ask how could it happen that Rodrigues did not discover how popular he was in South Africa? Because that is how far away we are from everyone else in the rock music world. I don’t say this as a criticism or some cynical statement about the local music industry, it’s just a simple mixture of geography and cultural preferences – South Africa is a very big place and most people are into house music or jazz or gospel – but in general it means that…. 2) Your expectations of what you can achieve in the local market need to be very realistic. A hit single on radio in South Africa, or even three or four, do not a salary make. So as hard as you work on your craft and as much as you hope for massive success or that someone will find you and make you famous in the world, at some point (if you really want to give it a shot) you will need to take yourself off to a place where your expectations can be matched by the possibilities that are on offer. That means saving enough spending cash for a lengthy stay and buying yourself an airplane ticket to some cultural centre (Berlin, London, New York, Seattle, Austin, Sydney, Toronto, Tokyo, wherever you choose). I know this sounds daunting and crazy but, as a pleasant surprise, when you get there you will discover that…. 3) The people you meet there – the ones at the types of gigs you will be playing – the musicians, the punters, the club owners, are much like they are at home. Some of them are interesting, some are not, some are assholes, some are not, some are cooler or better than you at singing or playing guitar or writing songs, and some are not. Some of them will become your friends and some will not. Because it is not the people or the talent that is the difference, it is…. 5) There are the are more musicians trying to make it (at all different levels – from people singing out of tune at an opening mic night, to hopefuls like me, to professional buskers, to small indie acts touring the continent months after months, to established acts with small but dedicated followings, to arena fillers like The Black Keys or Lana Del Rey and stadium fillers like Bruce Springsteen) there are also…. 6) More venues, labels, managers, bookers, PR people, records stores, etc, etc, etc. And most importantly, there are…. 8) There is still no substitute for hard work over a good long time. Hard work and the ability to be honest with yourself about what, in the context of your priorities, is working for your career and what is not. Not even sublime talent will get you anywhere near as far (unless someone else is doing all that work and thinking for you). Only with the effort comes the lucky breaks. And even if you eventually decide to put the brakes on your search for the breaks at least you will have really given it your all and had an incredible adventure, for neither of which there can be no real shame or disappointment.